We now briefly discuss the operation of the flyback converter. The underlying circuit is a PWM flyback converter, running in continuous mode. First of all, when the MOSFET turns on, given that the polarity of the transformer is reversed, a current flows to the primary winding of the transformer, where energy is stored. At this time, the diode is off. Next, when the MOSFET turns off, the stored energy is output through the diode from the secondary winding of the transformer, and after undergoing rectification and smoothing, it generates a DC voltage. When the MOSFET turns on, a current flows to the primary winding of the transformer, where energy is stored. During this time, the diode remains off. When the MOSFET turns off, the stored energy is output through the diode from the secondary winding of the transformer. Because a gap is provided in the core of the transformer, the flyback method involves an increase in magnetic leakage flux, causing the generation of leakage inductance. Although a switching current also flows to the leakage inductance, resulting in a build-up of energy, because the transformer is not coupled to the other windings, there is no transfer of power. 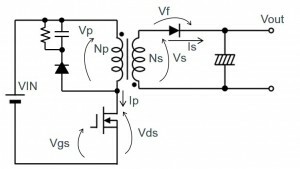 This generates a surge voltage to the drain of the MOSFET, as indicated by the Vds waveform shown above. A generated surge voltage exceeding the voltage tolerance of the MOSFET can lead to the destruction of the MOSFET. To prevent this possibility, a snubber circuit is provided that suppresses the surge voltage. In the above circuit diagram, the circuit composed of a resistor, a diode, and a capacitor provided on the primary side represent a snubber circuit. Keep in mind that snubber circuits are basically necessary in flyback converters. ・Strive to attain a solid understanding of basic operations, currents, and voltage. ・Snubber circuits are basically necessary. 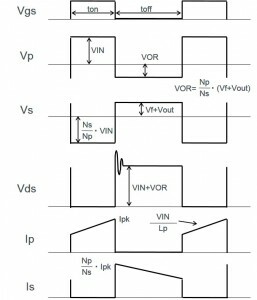 Isolated Flyback Converter Basics: What are Discontinuous Mode and Continuous Mode?